India may be wanting to eliminate malaria by 2030, but available details suggest that not only India is far from achieving the aim, "between 2012 and 2016, there has been a 300% rise in the cases of chikungunya, dengue followed at 157% and Japanese encephalitis at 124%." Pointing towards how deadlier forms of mosquito-borne diseases are on the rise, a top site which has 'checked facts' on the ground says, "cases of malaria alone rose by 2% over the same period". Researchers Swagata Yadavar and Delna Abraham say, while the Government of India may have declared on July 12, 2017 the national strategic plan for malaria elimination (2017-22) to oust the disease by 2027 and maintain the status till 2030 and beyond, the country has to confront with the fact that it "recorded 89% of total malaria incidence in South East Asia in 2016". The researchers say, there were 1,090,724 cases of malaria in 2016, of which 331 proved fatal, and while dengue cases were 1/10th of malaria, and caused nearly as many deaths. A viral disease spread by the Aedes mosquito, in 2012, there were 50,022 cases of dengue, which grew to 129,166 in 2016, according to figures by the National Vector Borne Disease Control Program (NVBDCP). "Dengue caused 242 deaths in 2012 and 245 in 2016, comparable to the 331 deaths in 2016 due to malaria. This is despite the fact that the dengue affected one-tenth the number of people who had malaria", they add. As for chikungunya, which causes debilitating joint pains and is also spread by the Aedes mosquito, it affected 15,977 people in 2012 and 64,054 in 2016. "Even though government records say that the disease has yet to prove fatal, there have been media reports of recent chikungunya deaths", the researchers insist. "More research is needed to conclusively rule out the possibility that the disease can kill patients", the researchers quote Dr Saumya Swaminathan, director general of the Indian Council of Medical Research, as saying. Coming to Japanese encephalitis, a viral brain fever spread by Culex mosquito that is seen more commonly in eastern India, the researchers say, "In 2012, it affected 745 Indians, and the number grew to 1,676 in 2016. The number of deaths caused by the disease rose from 140 in 2012 to 283 in 2016." 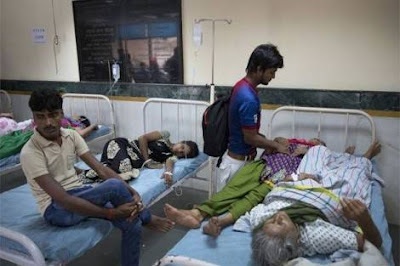 The researchers further reveal that the data, collected from the public health system are "misleading" and have been "underestimated", insisting, "Figures collected from the medical cause of death certificates issued in Delhi showed that dengue fatalities were eight times higher than those stated by the NVBDCP." "Even in Mumbai, there were 103 deaths due to malaria in 2014-15, according to medical cause of death data from municipal records accessed by Praja Foundation. But the NVBDCP data showed only 68 deaths due to malaria in the whole state of Maharashtra", they add. The researchers say, "For its data, NVBDCP is dependent on monitoring and surveillance by primary health centres, malaria clinics, community health centres and secondary and tertiary-level health institutions. It misses figures from the private sector where a majority of the population seeks care." Pointing out that though tribals, 8% of India's total population, they account for 70% malarial deaths, the researchers say, "Inaccessible regions of India, such as tribal and mountainous belts, where only 20% of Indians live, report 80% of malaria cases", with Chhattisgarh, Jharkhand, Madhya Pradesh and Orissa together reporting 74% of all malaria cases in 2016. “Even though the tribal population is 8% of India’s total population, it accounts for 70% of malarial deaths,” Sushil Patil, clinical coordinator, Jan Swasthya Sahyog, a non-profit organisation that provides low-cost health care in the tribal areas of Bilaspur in Chhattisgarh, is quoted as saying. Blaming things on "shortage of staff and sanctioned posts for health workers and programme staff throughout the country", the researchers say, "There are 40,000 multipurpose workers against 80,000 posts sanctioned for nearly 150,000 sub-centres in the country". "There is a shortage of qualified entomologists (experts in insects) in the country leading to poor vector surveillance and lack of robust data on entomological aspects of malaria,” they add quoting a government report.